When I first started gardening on Crete I tried growing all the usuals like cucumbers, tomatoes, peppers, salads and various fruits including grapes. I’ve since discovered that cucumbers tomatoes and peppers are so cheap it’s better to buy them and that grapes over my pergola just get annihilated by the wind and leave a mess over my terrace. I tried various seeds bought in UK garden centres and had some successes and some failures. But always the best was to collect seeds and cuttings here and use them. One day while walking through a small village called Vori I saw, growing in a pot, a large chilli bush, a shrub really. I collected some of the fallen chillies and planted their seeds. Someone also gave me a branch from another chilli bush that produced small hot chillies that go through and amazing colour transformation, from green to yellow, to purple then orange then read. It looked like a Christmas decoration. I started growing these too. 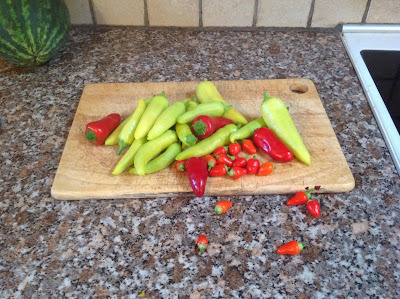 In my first year of growing both varieties I got a large crop of chillies — much more than I could possibly use in a con carne. Being brought up not to waste things I searched out recipes for sweet chilli sauce, which I do like. In the end I put together my own recipe and it has been a success. Others here on Crete use it, including some Greeks. If you’re interested, here it is: two mugs of vinegar, two of sugar, one whole bulb of garlic and half a kilo of chillies. Put through a food processor but don’t chop too fine, boil in a saucepan adding cornflour to thicken, and then pour into hot jars and seal. I found that I was more interested then in growing chillies than any other plant and this year did some buying over the internet — getting many different varieties of chilli seeds. From memory I have habanero, fresno, rococo yellow, capsicum, tabasco, jalapeño, scotch bonnet, Bhut something or other and many more besides. Disappointingly many did not germinate but, still, that would have been about 300 plants. Those that did grow you see here. I am now collecting my first crops and soon it will be time to make chilli sauce! Good to see, I do enjoy your blog. When we moved to the wilds of Oklahoma nearly 20 years ago I had visions of gardening and growing at least half our own food. Alas, for a variety of reasons those dreams did not come true. We do usually manage to grow a few tomatoes and banana peppers. I ordered the Owner trilogy yesterday. I think I've read most of the the Polity novels and it's been a few months since I read one of your books. Looking forward to it. I'd put sweet chilli sauce on my cornflakes if i could so i'll definately try that recipe. Something my mum used to do with excess chillies from her plant would be to fill an old vinegar or worchestershire sauce bottle with them and then pour in sweet sherry and leave for a month or so. You end up with a delicious 'fire water' that work well in soups, chicken especially.